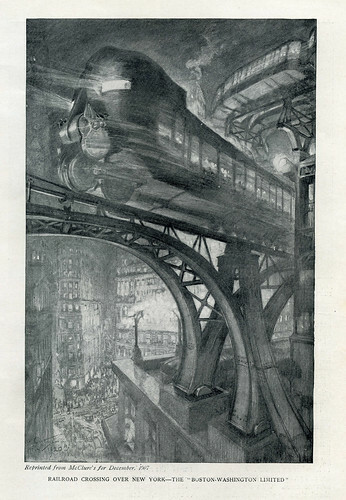 A proposed elevated line running from Washington to Boston based on the gyroscope-balanced monorail car Irish-Australian inventor, Louis Brennan. His model, introduced in 1909. while successfully demonstrated, never reached mass production. Amtrak’s Acela tilting trains can reach 150mph. Brennan said his might reach 200mph. This entry was posted in Images, Old News, Science&Tech and tagged Amtrak, Forgotten Technology, Louis Brennan, Monorail, New York, Paleofuture, Transportation. Bookmark the permalink.